Polly Pocket, your pocket-sized girl with the blonde hair and blue eyes. The Polly Pocket toys created in the early 80s by UK based Bluebird Toys (then the dolls were further developed by toy giant Mattel) was a hit sensation in the early 90's with her iconic pink heart shaped bag. 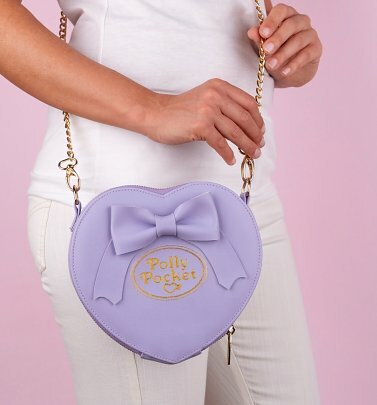 Polly Pocket stormed into popularity and became a very much sought-after fashion accessory with the younger school girl market, which is why at TruffleShuffle we have made it our mission to bring you official Polly Pocket clothing, gifts & accessories from the pink loving lady herself. Polly as we all know, was a cool, confident & adventurous young girl with a wide variety of hobbies such as roller skating, water skiing & snowboarding. Oh, and like any girl you know, she shopped till she dropped! Here at Truffle Shuffle we're Polly Pocket mad and can all remember the 90's hit toy line, for some it's ingrained in our childhood! Polly herself has decided to lend us her Polly Pocket Bag so get involved before she decides to go shopping again! 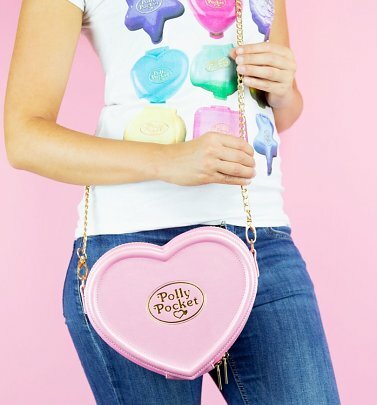 If you're looking for Polly Pocket clothing we have got you covered, treat yourself or buy a gift your favourite lady in your like by purchasing official Polly Pocket t-shirts for adults and kids, sweaters & accessories from your favourite retro supplier. Relive your childhood & Order online today at TruffleShuffle!